The naval blockade of Yemen has entangled a careless Australia. Images of Australian and Saudi sailors conducting a joint boarding exercise in the Red Sea in August illustrate just how easy it is for the military to become entangled in political controversies in the Middle East unless on high alert for possible compromise. Saudi Arabia is leading a coalition in a war in Yemen that has dragged on since 2015, relying on its expensive arsenal of equipment rather than fighting on the ground on inhospitable terrain. The Saudi-led effort has been heavily criticised for its blunt use of force from the air and lack of concern for civilian casualties. The Saudis have also imposed a naval blockade of Yemeni Red Sea ports held by the Houthi-led coalition, compounding a humanitarian crisis and leaving Riyadh sensitive to criticism. 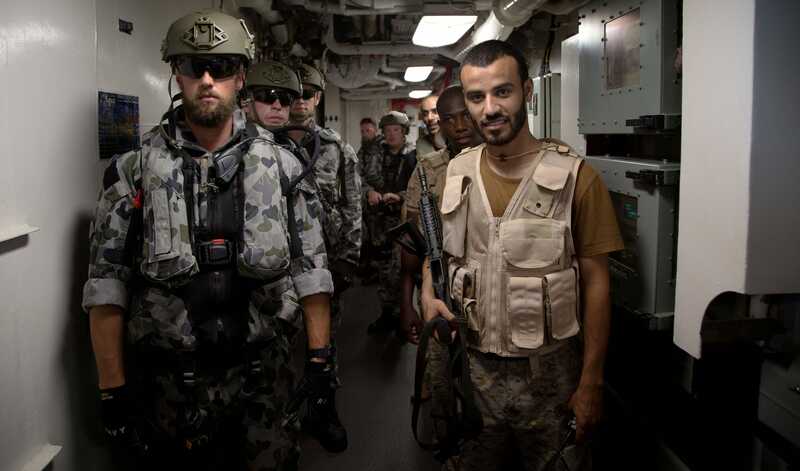 Enter Australia, which went ahead with an exercise with the Saudi navy. The Royal Australian Navy always deploys a major fleet unit to the Middle East as part of the Combined Task Force 150, focused on counter-terrorism and maritime security operations. But these ships also promote broader Australian interests through visits to regional ports or the conduct of passing exercises (PASSEX), which can be simple activities with ships of other navies. Both these types of activities are an essential grease to the wheels of military diplomacy, and it looks as if the Saudi exercise was just such an operation. From appearances, the boarding exercise took place with HMAS Newcastle and the Saudi navy’s replenishment oiler Boraida. While no details have been released, the action may well have been organised at the local level between the commanders on the two ships. Yet regardless of whether it was approved higher up the chain of command, bilateral military activities with Saudi forces should be heavily scrutinised. Conducting boarding-party training with the Saudi navy, which is prosecuting a heavily criticised naval blockade in the same maritime zone, was certainly not a smart move given that boarding operations are such a key aspect of enforcing a blockade. Defence Minister Marise Payne has declared Australia is in no way involved in the blockade. But this is hardly convincing when providing boarding-party training to the very navy carrying out the blockade. Nor did Payne encourage much confidence in her knowledge of an issue for which she is ultimately responsible when telling parliament she would consult Foreign Minister Julie Bishop’s office before deciding whether she was ready to condemn the Saudi naval blockade of Yemen. Payne has an entire International Policy Division at her disposal within the Defence Department. It is reasonable to expect that, given the sensitivity of the subject, the government’s view of the blockade (provided it actually has one) would be known by the Defence Minister. The guidelines for interaction between Australian military assets and Saudi coalition assets would surely have been developed and promulgated. The Middle East is a complex place, and even a seemingly innocuous tactical-level naval activity can send the wrong message unless a little common sense is applied.